The oven illustrated is a steam heated BATCH TYPE DRUM WARMING OVEN, that was manufactured for an U.S. producer of petroleum products. It is designed to allow the heating of (24) twenty-four 55-gallon drums per batch. It is a 300°F oven with (3) three heat coils, a 10 gauge steel floor, heavy-duty pallet guides, spark resistant hardware and fans, and large spillage capture pans with grating and drains. 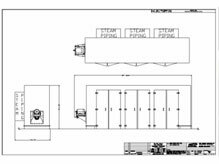 The approximate overall size including base channel, plug fan, and steam piping is 26 feet long x 8 feet wide X 10 feet high.